Inspired by her beloved grandfather, an old sailor, Jackson Romijn knew by the age of eight that she wanted to get tattoos. 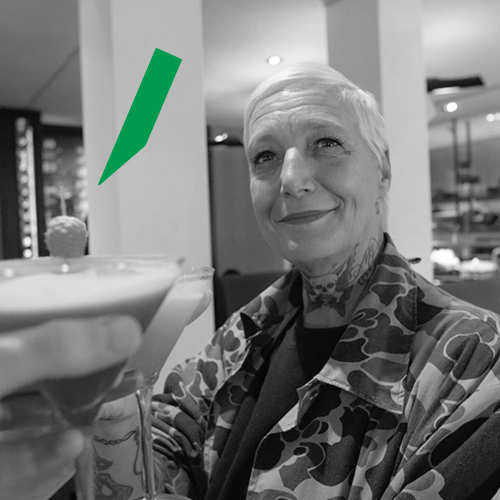 Her strong personality – and love for tattoos - even survived the boarding school, an attempt to turn her into someone who would follow what is called the social norm. After finishing high school, Jackson hit the road and worked in various areas, from a bank to an ad agency to a production company in New York, where she was involved in developing commercials for companies such as Coca Cola. Back in the Netherlands, she met the father of her two kids, a tattoo artist with whom she travelled to tattoo conventions across the globe. Again returning to her home country, she started working with kids at a school for 12 years before life opened the next door for her when she was asked to become the resident DJ at a newly opened club in Amsterdam. Since then, Jackson worked as a doorhost and host for clubs and restaurants across town. Currently she is a host in the Amsterdam restaurant Tulp and guides tours through the Red Light District.